If you are fortunate enough to be a grandparent, you understand the joy a grandchild brings into your life. Becoming a grandparent may also prompt you to make some changes to your estate plan if you wish to include your grandchildren in your plan. A Los Angeles living trust attorney at Collins Law Office explains why using a living trust to gift to grandchildren is often a much better option than relying on your Will to make those gifts. The Last Will and Testament you executed when you initially created an estate plan may continue to serve as the foundation of your estate plan today. While a Will can effectively distribute your entire estate after your death, most people eventually require more than just a Will to achieve all of their estate planning goals. This is definitely the case if you wish to include your young grandchildren in your estate plan because a minor child cannot legally inherit directly from your estate. As such, your young grandchildren cannot receive gifts made directly from your Will. For many people in your position, a living trust is the solution. 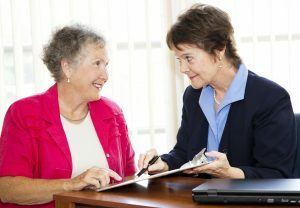 A trust is a fiduciary legal arrangement that allows a third party, referred to as a Trustee, to hold assets on behalf of a beneficiary or beneficiaries. Trusts can be arranged in many ways and can specify exactly how and when the assets pass to the beneficiaries. All trusts can be broadly divided into two categories – testamentary or living (inter vivos) trusts. Testamentary trusts are typically activated by a provision in the Settlor’s (trust creator) Last Will and Testament and, therefore, do not become active during the lifetime of the Settlor. Conversely, a living trust activates during the Settlor’s lifetime. Living trusts can be further sub-divided into revocable and irrevocable living trusts. If the trust is a revocable living trust, as the name implies, the Settlor may modify or terminate the trust at any time. 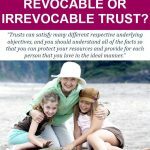 An irrevocable living trust, however, cannot be modified or revoked by the Settlor at any time nor for any reason unless a court grants the right to revoke or modify the trust. Why Is a Living Trust a Good Choice to Gift to Grandchildren? A revocable living trust is an excellent estate planning tool for making gifts to grandchildren for several reasons. One important reason is that by using a living trust to hold assets intended for your grandchildren you are able to appoint someone of your choosing as the Trustee of the trust. The Trustee is responsible for protecting and managing the trust assets for the duration of the trust. By contrast, assets left to your grandchildren in your Will would also need someone to manage them until your grandchildren reach the age of majority; however, you would have no say in who that person is. Furthermore, as the Settlor of the trust you are able to create trust terms that direct a staggered distribution of trust funds instead of a lump sum when your grandchildren are old enough to inherit directly. Staggering an inheritance is usually wise when a beneficiary is relatively young an inexperienced with money. You can also use those trust terms to retain a certain amount of control, if you so choose, over how the trust assets are used by your grandchildren. For example, if education is important to you, you could create trust terms that only allow the trust assets to be used to pay for educational expenses. Finally, one of the most important benefits of using any type of trust to distribute estate assets is that trust assets do not go through probate. Consequently, your beneficiaries – including your grandchildren — can access the assets gifted to them immediately following your death instead of having to wait until the end of the probate process which can take months, or even years, to terminate. For more information, please join us for an upcoming FREE seminar. If you have additional questions about using a living trust to make gifts to your grandchildren, contact an experienced Los Angeles living trust attorney. 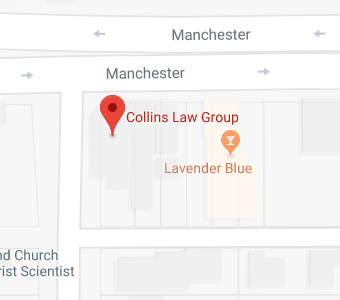 Contact the Collins Law Group by calling (310) 677-9787 to register for one of our FREE estate planning workshops.